Aldi has announced it will hire 5,000 more staff in the UK this year and plans to open 80 new stores. The expansion will take the discount supermarket to 700 shops and more than 32,000 employees in the UK. Jobs will include managers, stock assistants and store staff, Aldi said. The German-owned company was the UK's sixth-biggest supermarket with a 5.6% market share in the 12 months to January 31, according to analysts at Kantar Worldpanel. Along with fellow German retailer Lidl, the company has doubled its market share in the last three years and forced the "big four" supermarkets - Tesco, Sainsbury's, Asda and Morrisons - to slash prices. Ruth Doyle, Aldi's regional managing director, said the new staff would "support our continued expansion and the ongoing performance of our existing stores". 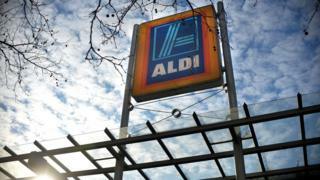 However, UK supermarket investors were calm about Aldi's move. Tesco shares rose 1% on Monday, while Sainsbury's and Morrisons both added more than 3%.